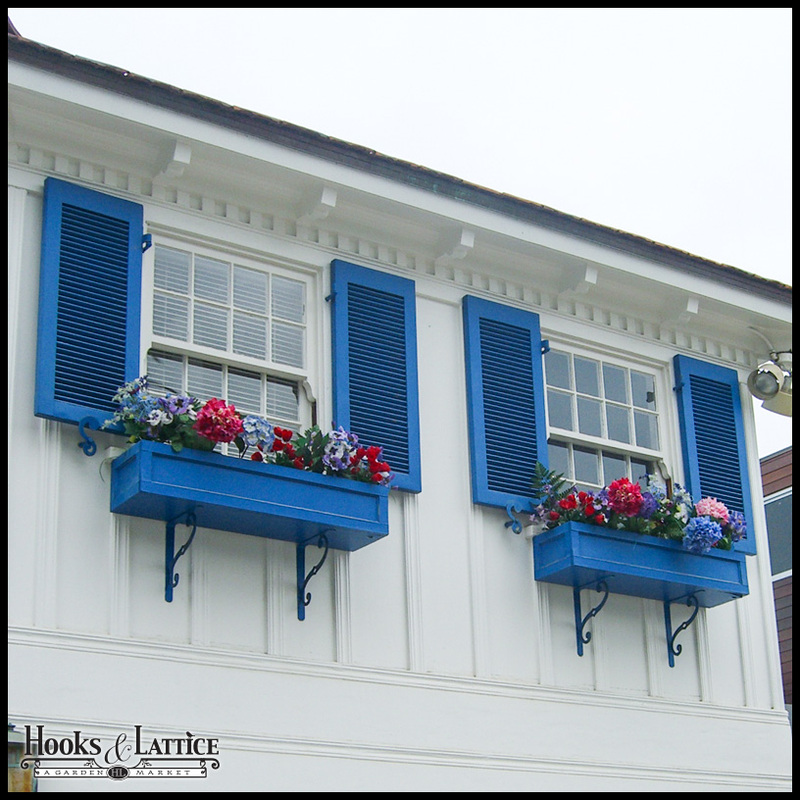 Boasting some of the most beautiful exterior shutters on the market, we here at Hooks and Lattice are devoted to elegance and beauty in the name of home decor. We believe every home, apartment, and business could use a little sprucing up, especially to boost custom curb appeal. Our array of window shutters vary in size, shape, and color – and we can customize those aspects to suit your decor needs and specifications. If you have only just begun thinking about exterior shutters to enhance the elegance of your home decor, we have some helpful advice on shutter types, as well as how to measure & install shutters, to get you started. The right composite window shutters can make or break the curb appeal of your home, apartment, of business. Take for example a small office building incorporated within an old-fashioned, yet beautiful, Colonial home. The home could be lovely shades of blue and white with tinges of dark brown, representative of a timeless look. When pondering exterior shutters for this type of place, you would want to match the colors of the exterior home decor to the shutters. Tackiness can be the death of curb appeal. To choose the perfect shades and colors of your composite window shutters, you have to really examine your home – getting up close to pinpoint and pick out both bold and subtle hues in your decor. After that, choosing and matching up colorful, or neutral, exterior shutters should be a breeze. Hooks and Lattice shutters come with guarantees of ease. We believe the best house shutters are those that require very little time to install, but provide years, perhaps even decades, of beautiful decor elegance. We offer two options for installation of your window shutters – decorative mount or operable use. 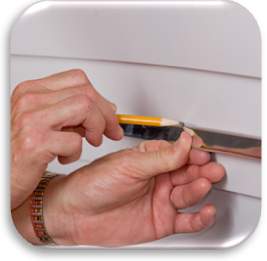 Each pair of shutters includes the hardware required to mount them, as well as instructions on how to secure the pairs into place. For example, for fixed shutters, you would hold the shutter in place while drilling into your window frame. Hook the hardware into the drilled holes, and voila! You have a perfectly mounted pair of decorative shutters to accentuate your home and add instant elegance to your exterior decor. Hooks & Lattice Shutters – For the Win! We take pride in saying, and being able to back up the fact, that our exterior window shutters in all their colors and shutter styles are the best. You simply cannot find the quality, care, and customization in big box stores. Add to the fact that we offer advice on upkeep, as well as guarantees, and you can see why our exterior shutters have been ranked at the tip top when it comes to home improvement. Bring elegance to your home decor with a pair of house shutters from our slew of high-quality house enhancements! Use our Exterior Shutter Buying Guide to help you choose the best shutters for your home or business. Water is not always a free-flowing resource, especially as we look for new forms of conservation and ways to limit our impact on the environment. Luckily, there are steps you can take to ensure you do not waste water while keeping your plants healthy. Whether you have difficulty keeping your plants watered or want to learn new ways to help the environment, the use of self-watering planters will be beneficial. Keep reading to learn more about self-watering reservoirs and how to begin conserving water to do your part for the environment this Earth Day. When choosing a planter reservoir, pick from a range of sizes to fit your existing planter or contact us for custom sizes and orders, including planter reservoirs for window boxes, planter boxes, and even hanging baskets. No matter what type of plant you want to grow, you can make any container self-watering by adding one of our quality water reservoirs. In order for your planter to properly disperse water, follow our instructions for using a planter well self-watering reservoir and look over some of the sizes we have available. This is something that any homeowner can do and setting up your self-watering planter is not a complicated task. In addition to window boxes, we also have a range of options for those wanting flowerpot reservoir inserts. If you need to utilize a hanging basket for your plants, we have you covered. 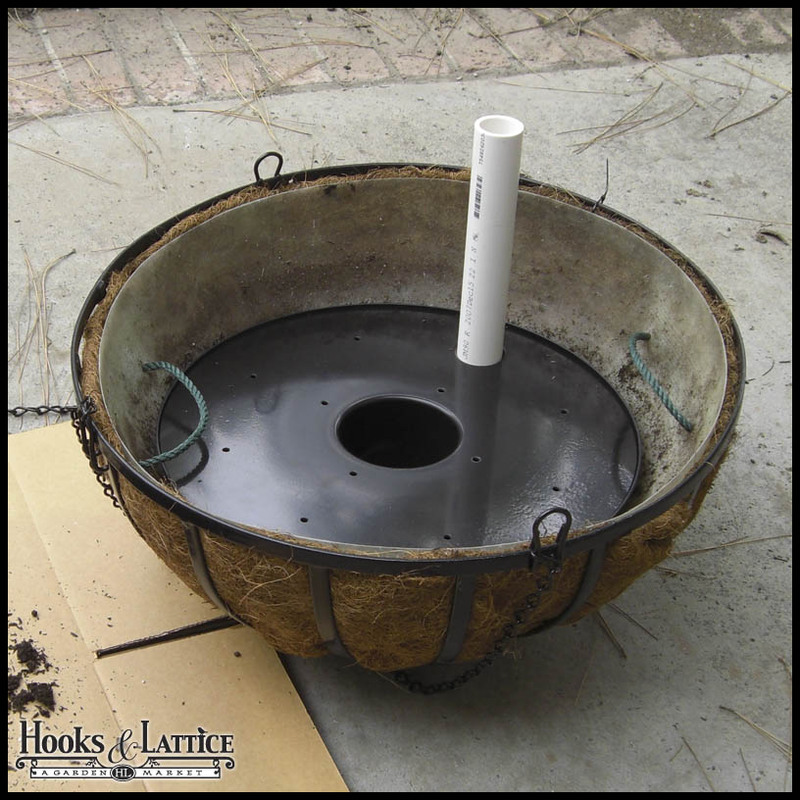 We have two separate options for your hanging plants – choose from a fiberglass hanging basket insert, which is a perfect match for our coconut coir basket liners, and a hanging basket planter reservoir. Both are easy to install and simple to refill. Fiberglass inserts and planter reservoirs are the best solution for hanging basket flowers. We also have square self-watering systems for square containers and large rounded reservoirs for larger planters. These reservoirs are installed in the same manner as the other water systems and over time you will discover that they offer a great return on investment. Yet another solution for saving water and the time needed to refill your reservoir is the use of a rain catcher. These large water reservoirs can collect rain run-off from your downspouts, making the entire process hassle-free. Rain catchers are a great way to save water and use it where you need it. Having a planter reservoir can help you save time and money by limiting the amount of work needed to care for your plants on a regular basis and helping you conserve water. In some areas, recent droughts have led to water rationing and an increase in water utility rates. Save water in the garden and time needed to care for plants. As a bonus, conserving water is a great step towards limiting your use of natural resources and helping out the environment. For any type of plant life, you can save water, time, and money, by using a planter reservoir. To start saving water while caring for your plant life, visit our website and take a look at our self-watering reservoirs for window boxes, planters, and hanging baskets. For custom sizes and order, feel free to contact us any time. With their crisp lines and beautiful plants and flowers, window boxes are a great addition to any interior or exterior window. But the finishing touch to creating a show-stopping piece is something small – a faux bracket or decorate corbel. Our window planter boxes are so sturdy and easy to install that they don’t need visible brackets supporting them from underneath. However, faux brackets can add a great detail to a window box and provide the perfect finishing touch. Our faux brackets come in a variety of styles to match our many window box options. Faux brackets for our PVC window boxes are made of resilient weather resistant materiel and are designed to not rot or mildew while providing you a lifetime of beautiful flower boxes that look like real wood. Check out our selection of composite flower boxes and brackets to find the perfect style for your home. 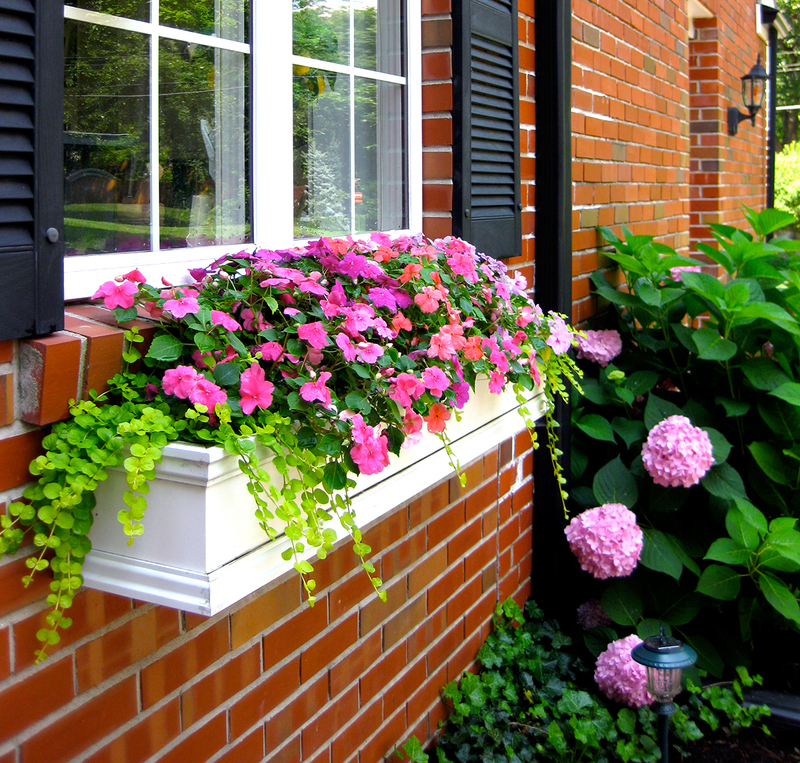 Fake brackets for direct mount window boxes can be painted to coordinate with the flowers or color scheme of your home. 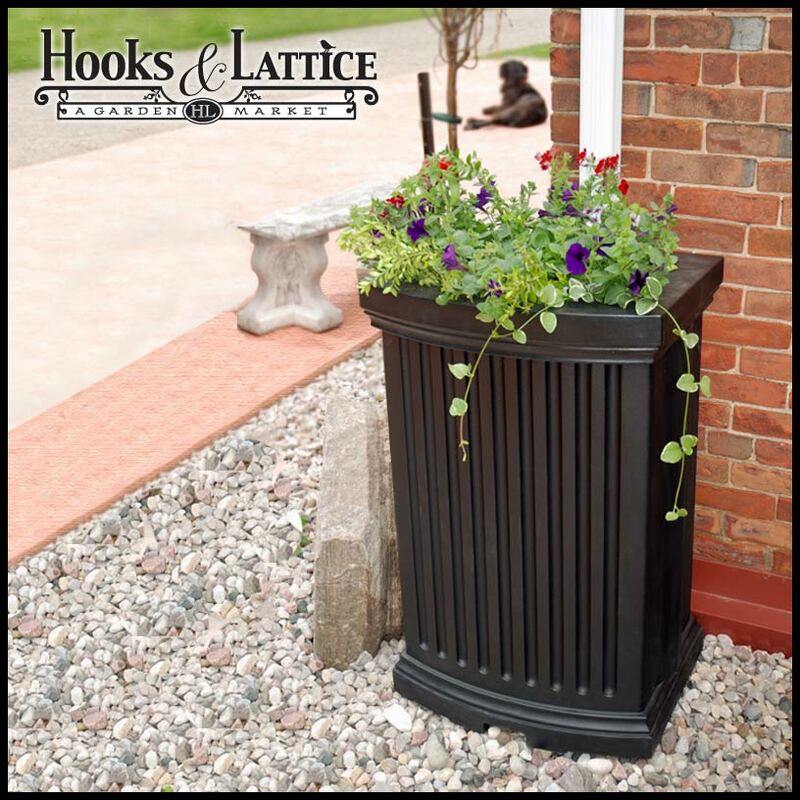 If your PVC flower boxes fall into the XL category (these boxes have an XL before the name, such as XL Premier Hampton or XL Premier Laguna), the classic XL faux bracket is the right size and style for you. All other types of PVC window boxes work well with the standard faux bracket. No matter the size, the traditional shape of these brackets make them a subtle but stylish accent to complete your look. Once you have determined the style of your window box brackets, you need to purchase the correct amount. Faux brackets are sold individually, so you can purchase as many as you desire. When using multiple brackets, measure in from the sides so that the brackets are spaced evenly to create a cohesive and uniform look. 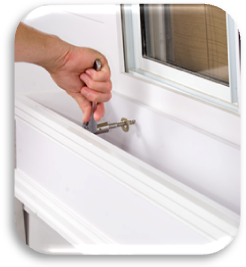 Installing the brackets is a simple process – after measuring and lightly marking where each bracket will go, use a PVC adhesive to attach brackets to the bottom of the window box and allow to dry. The window boxes can them be hung easily using normal installation instructions. Faux brackets are a simple detail that can make a big impact on the overall look of your window boxes. It doesn’t take much time or effort to put together a flawless and complete look! For more information about decorative brackets for window boxes, go to Hooks & Lattice and check out our Brackets section. Baby showers are a time to celebrate a sweet new bundle of joy and a great opportunity for ladies to get together for a fun party. But when planning a baby shower and dealing with all of the games, food, and decor, it helps to have something to save time and make a statement. Artificial floral arrangements are a simple way pull things together for a polished and creative baby shower and make for unique baby shower decorations. No matter the season of your baby shower, artificial flowers are always in bloom. It’s easy to incorporate artificial arrangements into any baby shower theme. Think color! Welcome the bright blooms of spring with silk flowers-no need to worry about getting your bulbs in time to enjoy a breath of fresh air. Spring is all about new life, so incorporate bright colors and interesting shapes. After a long winter, it’s nice to have flowers that bring joy and gladness. A chic spring decoration is this potted peony arrangement. The vivid pinks and crisp whites paired with a chic container make for the perfect springtime baby shower décor for a baby girl. For a boy, incorporate green, blue, or yellow flowers. Let your creativity run wild in the summer. It’s time for a laid back shower with bright colors and interesting blooms. Break out of the mold and try arrangements in unique shapes and containers, like this country delight arrangement in a watering can. Sunny colors and big blooms make summer arrangements extra special. And with artificial flowers you don’t need to worry about the heat turning your baby shower flowers to a crisp-they can look great and last throughout the season. This artificial arrangement has tulip, roses and hydrangeas – the perfect baby shower centerpiece! As the air begins to grow crisper, bring in the warm earth tones of autumn with color and earth-inspired textures. Fall flower arrangements can be rustic and include pumpkins and hay bales, or can stay sophisticated, like this rose and hydrangea arrangement in stunning fall colors and perfect for a boy or girl. No matter the style, look for artificial flowers in coordinating rich reds, oranges, and browns to match the changing leaves outside. Keep things crisp in the winter by using monochromatic flowers in somber shades. This stunning gender-neutral snapdragon arrangement uses crisp white to match the snowfall, but brings in rich emerald greens for a dash of color. Winter floral tend to be more sophisticated and traditional, but don’t be afraid to bring in color in small doses. Throughout the year, artificial flowers are the perfect accent to a baby shower. 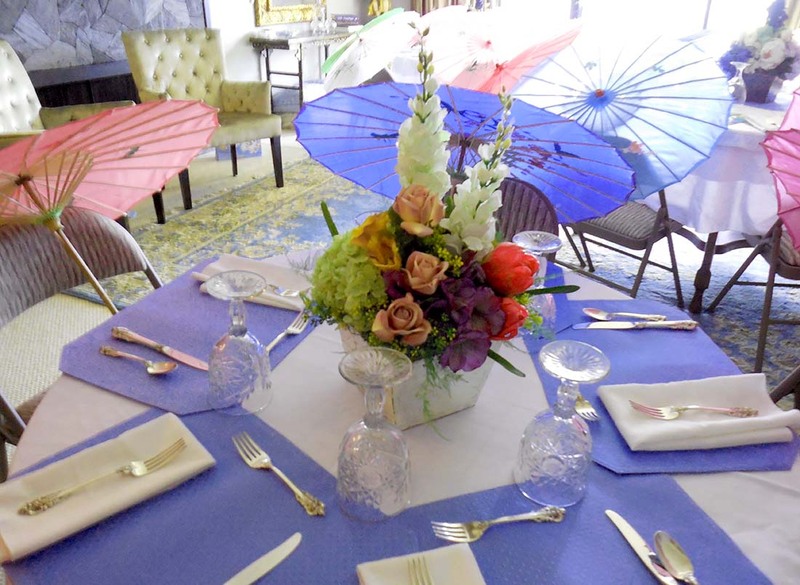 And with quality design and artificial arrangements, your guests won’t even be able to tell the flowers aren’t real. After the party planning is done, you can enjoy the beauty of a gorgeous floral arrangement and the smiles of a newborn baby. There aren’t many scents more delicious than garlic-laden food simmering in your kitchen. This bulbous plant is used around the world as a seasonings and condiment. Its popularity has made it a staple in modern grocery stores and specialty markets. Still, store-bought garlic can’t compare to fresh garlic grown right in your own home. Garlic is a very hardy plant that can even be grown in the winter, so you and your family can enjoy its savory goodness all year long. 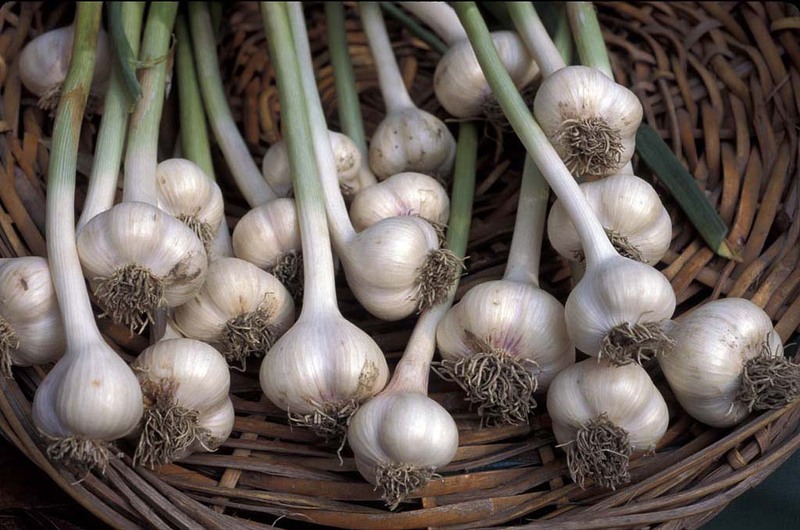 Growing garlic is similar to cooking with garlic, because both beginning chefs and seasoned cooks can excel at it. And here’s the best part: when you’re growing garlic in containers, no garden is necessary. No matter what container your select, make sure that it can withstand long exposure to sunlight. Here are two that are perfectly suited for the task. –Tinley ceramic planters. 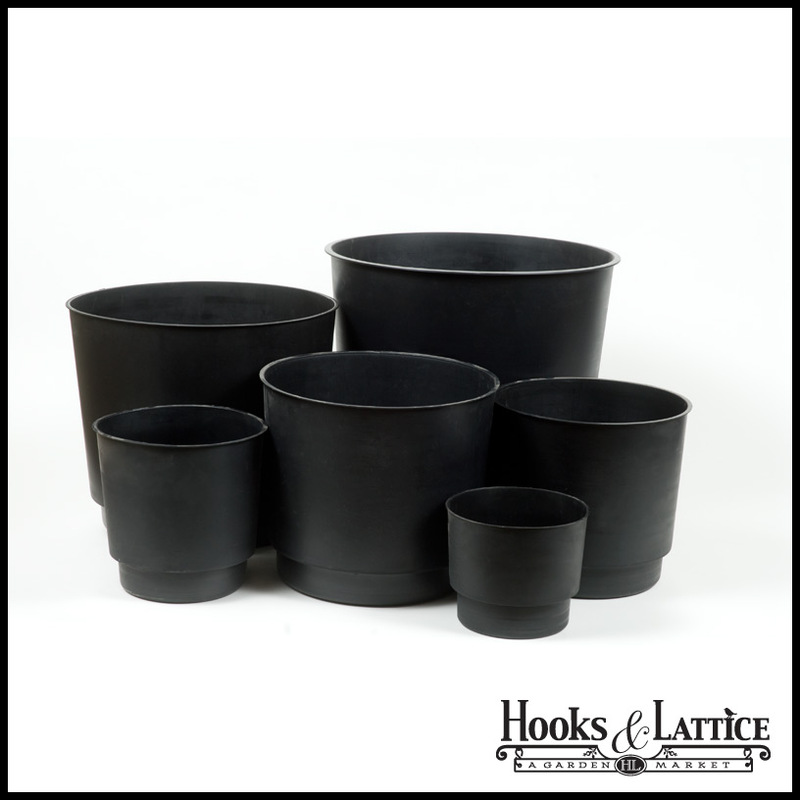 Designed with a tree-bark texture, these planter pots come in black, white, or brown. They are 13″ in both diameter and height, so they’re compact enough for any area of your kitchen, windowsill, or patio. – Vertical garden with containers. This multi-use product can be used to grow garlic or virtually any herb or seasoning you could imagine. The tough fir frame holds 16 small terra cotta pots that are as cute as they are functional. The sulfur compounds in garlic make it a tasty ingredient and great way to lower your blood pressure. If you’re not sure about what variety of garlic to plant, DigginFood has some great tips about selecting local garlic varieties. –Step 1: Choose a high-quality potting soil. Garlic is known to develop root fungus when grown in subpar soil. Fill your container with your soil, leaving approximately two inches of space at the top. –Step 2: Select the largest cloves and break them apart. Make sure not to break the paper-like wrapper that encases each clove. Plant them 3″ deep within the soil, and 5″ apart from each other. Fill each hole back up with soil, leaving 1″ between the tip of the clove and the surface. –Step 3: Gather straw or bamboo. During cold months, cover your garlic with these materials to keep them warm. Remove them immediately when the weather heats back up. –Step 4: Wait for your garlic to grow. Keep the soil moist at all times. Begin fertilizing it every three weeks with a liquid fertilizer. –Step 5: Harvest. When the bottom third of the leaves have yellowed, it’s time to pick your garlic! There is an endless amount of recipes you can prepare with garlic. From sauces to meat, your home-grown garlic is sure to be a hit with your family, friends, and guests. You can sprout seedlings in just about anything. Invest in long-term solutions for best success growing herbs in containers. Herbs require strong light to grow, which can be a problem if you’re trying to harvest chives during the short, dark days of winter. The best herbs to grow can be planted in indoor containers. Planting in herb containers, either indoors or outdoors, allows for the pots to be moved around according to the sun. If you plant an herb that needs less sun, like parsley, simply move it out of the sun in the middle of the day. On the flipside, you can move a sun-loving herb around your yard or house for optimal growth. The Glendon Tapered Round Planter can be used indoors or outdoors, allowing you to give your herbs the light they need. A good understanding of plant lifecycle helps when growing herbs. Allowing your herbs to go to seed and turn into flowers signals that their lifecycle is about to end. The best thing to do is to harvest your herbs frequently. Luckily, with something as delicious as fresh herbs, you will most likely be plucking it often. If you see a flower forming, just pinch it off to keep your herbs happy, healthy, and productive. A good herb container for keeping an eye on your plants is the Tinley Ceramic Low Bowl Planter, which has a short profile so your herbs and their progress are always in view. A successful herb garden starts right from the beginning with strategic planting. You may be tempted to cram lots of herbs into the herb container, but make sure to read the plant tag carefully and allow enough room for the fully grown herb – overcrowding can stop plants from expanding their root system and be harmful in the cold winter months. The best herbs to grow will easily fit into your pot now and when they are full size. A good option for an herb container that allows room for plenty of plants is the Danbury Round Planter, which has a wide diameter for plenty of planting room. With a little research and a little planning, a container herb garden will be spicing up your kitchen in no time! For best results, shop smaller containers that fit on countertops or tables. 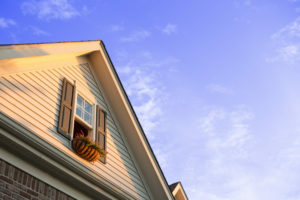 If you’re one of the millions of homeowners nationwide with vinyl siding, chances are you value materials and products that are long-lasting, low-maintenance and beautiful. As such, desired tips for increasing curb appeal should be affordable, durable and doable from a DIY perspective. The perfect project? Hanging window planters! With the help of this how-to guide, installing a window box on vinyl siding is made easy. 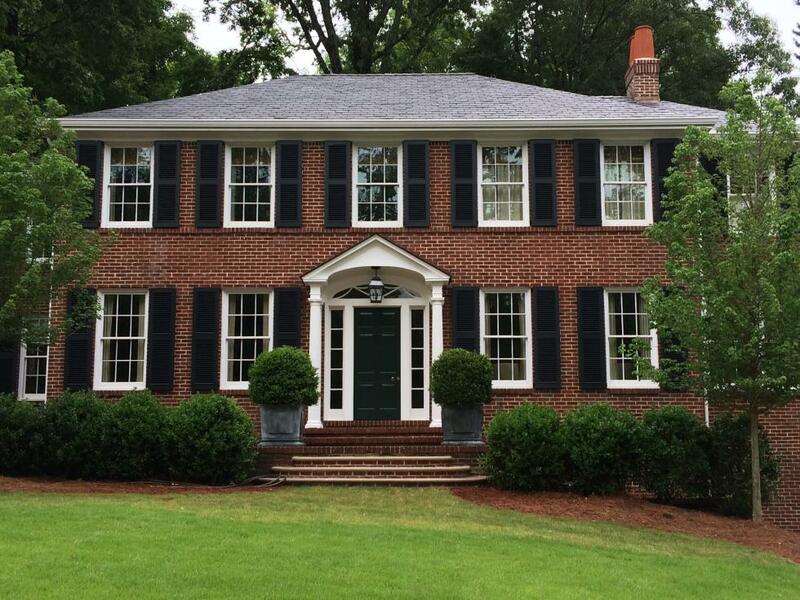 Here at Hooks And Lattice, our mission is to improve curb appeal for every abode, from ranch homes to colonials. And being that vinyl is the #1 siding used in the United States, many a homeowner will find this tutorial useful learning how to hang window boxes on vinyl siding. Deciding between the two is really a matter of preference. There’s no single best way to hang window boxes on vinyl siding, although we recommend a direct mount installation. Read on to see why. Wow does this house need window boxes! For dual-span windows, try one long window planter for a comprehensive look. A hayrack trough planter dresses up this dormer window. Raised panel shutters frame the opening for a polished exterior display. Get the appropriate hardware. Depending on the size and weight of your window box, we recommend these 1/4″ diameter bolts or 3/8″ diameter bolts. Find the wooden studs beneath vinyl siding. 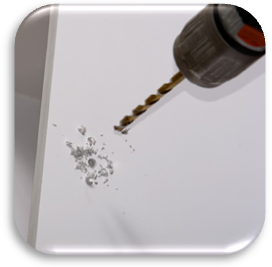 You will be drilling straight through in order to anchor mounting bolts right into studs. 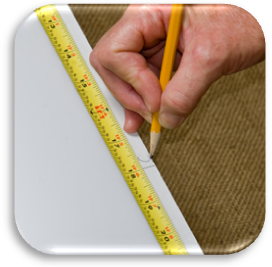 Measure your garden container to determine the distance between mounting brackets or holes in the frame. You will align this with your stud spacing. Note: If using a Hooks And Lattice Window Box made of wood, composite PVC or one of our metal cages, your container is compatible with standard 16″-18″ stud spacing. 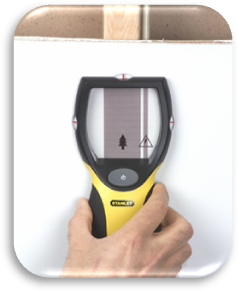 Use window box measurements to identify mounting position. Then mark your spots on the vinyl clearly to guide drilling. Drill starter holes into siding. Just enough to give the bolt an opening that will help to guide it through. Thread your first bolt through a pre-drilled mounting hole on the window box. Depending on their position, either begin with one side or, if there’s a center bracket or mounting tab, begin here. Attach your container to siding. Depending on how comfortable you are holding up the weight of your window box, this part can be a one or two-person job. While supporting the full weight of the planter, drill in your first threaded bolt all the way through to wood siding, just shy of tightening all the way. Finally, add remaining bolts and repeat the step above. Once the last is in and you’ve checked to make sure the display is straight, tighten bolts the rest of the way to secure the mount. Now you’re ready to try out all of your favorite container garden arrangements for spring, summer, fall and winter. For homes in colder climates, be sure to choose a weather resistant flower planter or choose window boxes with removable liners that are easy to winterize and store. A terrarium is small enough that it is manageable for a child, and the great growth conditions ensure that nearly everything they plant will thrive. Terrariums are great year round, or if you live in a climate that makes outdoor gardening difficult. It also creates a conversation piece and allows your child to show off their work! To begin, pick out a terrarium container. A great option is this fun apple shaped terrarium. Next, have your child help pick out the plants. Because terrariums act like mini-greenhouses, plants like succulents and cacti are great options. Pair with some river rocks and soil, and soon the plants will be growing. Terrariums can be placed indoors or outdoors and work on nearly every surface, even hung from the ceiling. Give the kids a breath of fresh air this summer with fun garden projects that are just their size! For a project that will always be in view, have your child take charge of a window planter. Wooden planters are great options because they are durable and will match whatever your child decides to plant inside. This redwood planter can be used as a window box or even as a standalone planter. Your child’s creativity can run wild when picking flowers and plants for the box-just remember to take into account the location of the planter in regards to sun and water needs. By picking a variety of colors, heights, and textures, your child can create their own masterpiece in plant form and it will be right outside the window to enjoy each day! A large garden can be intimidating for children, but many outdoor planters come in sizes that are perfect for little fingers. If your child needs a little gardening motivation, consider giving them a uniquely shaped planter to pique their interest. These volcanic rock planters are a fun option. For a larger project, this vertical pot garden allows kids to be in charge of just a few small pots that will still have a big impact. Help your child choose the right materials for planting, such as soil, fertilizer, and plants. Be sure to choose plants that will work in your climate and that are durable enough to withstand a novice junior gardener. 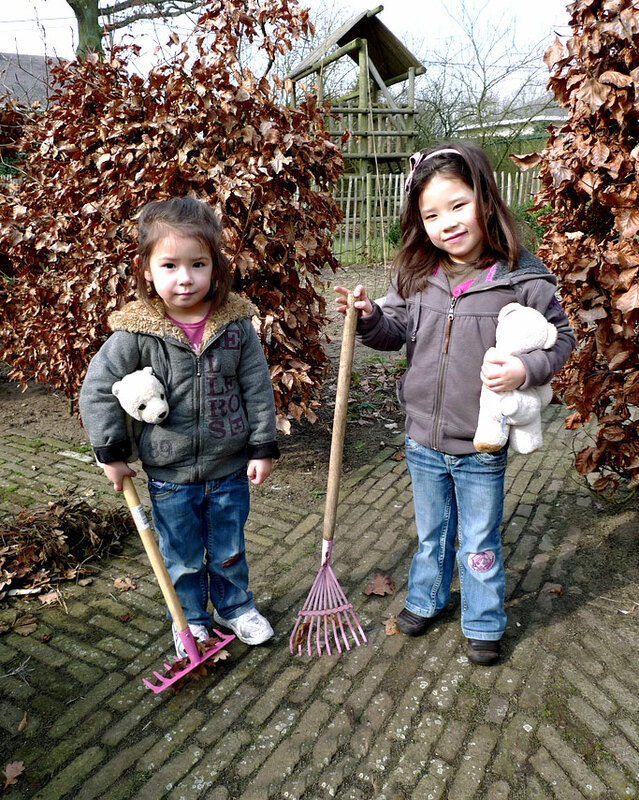 Gardening is a perfect family activity and a great chance for kids to get their hands dirty in a comfortable environment. With these fun kids gardening ideas, your family will be growing their green thumbs in no time! We all know that flower boxes are a great way to add life and color to any home. No matter how dull the walls might look, window boxes will add an element of cheerfulness and freshness to the image, significantly improving your home’s appeal. Moreover, you can also increase your house’s curb appeal by placing window boxes on railings, thus embellishing stairways, balconies or terraces. This is done with the help of flower box holders which, as the name suggests, allow you to attach your flower box to railing and support the weight of the planters. There are different kinds of holders, and they differ in terms of size, design and, most importantly, the type of the railing they are compatible with and the way in which they attach themselves to the railing. 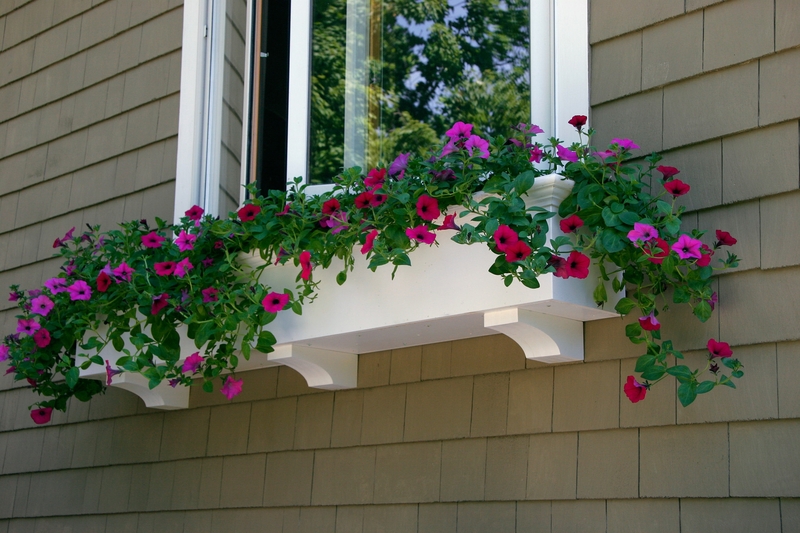 Wrought iron railing brackets suspend a beautifully planted Fiberglass Supreme window box. Railing brackets for wood decks allow you to attach planters securely without having to drill any holes in the material. This is very practical, as it allows you to rearrange planters whenever you feel like making a décor change, without worrying about any unaesthetic holes. 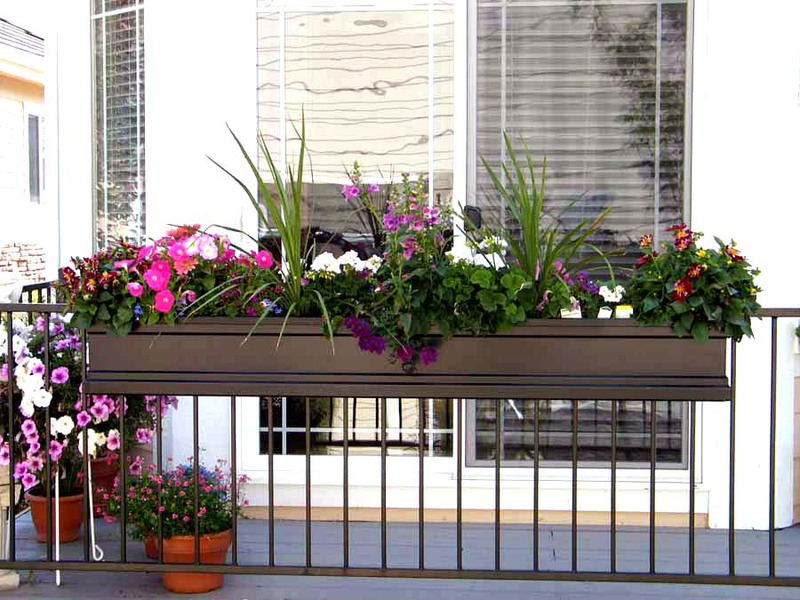 These planters use either adjustable railing hooks which allow them to fit on railings of different width, or a clamp system that utilizes an adjustable screw so that it can be attached to any wooden railings, regardless of their thickness. Many homes use wrought iron railings, which require less maintenance and have a longer lifespan than their wooden counterparts. Rail planters are attached to the deck through brackets similar to the ones for wooden railings. You can choose either adjustable deck railings or metal brackets for your specific rail width. You can find a great diversity of models of metal brackets for your specific needs. Make sure that you know the measurements of the window box you want to mount on the specific railing, as some types of holders are compatible with window boxes up to a certain width and/or length. And, if you are not opting for an adjustable holder, don’t forget to measure accurately the width of your railing before placing your order. Click Here to contact us for consultation. All holders on the market are coated with a special finish which makes them impervious to water and humidity, and thus less prone to rust. This ensures a long life expectancy of these products, making them a cost-efficient purchase which can help you add to the curb appeal of your home for many years to come.